Since my other post in October, the number of new food trucks popping up has increased exponentially. While traditional roach coaches are still wide spread selling their prepackaged sandwiches, gourmet food trucks are going strong. Many use Twitter and Facebook as their main source to get word out of where they’ll be located. 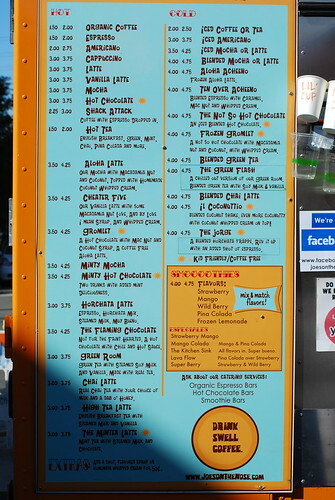 Here’s a rundown of a few San Diego-based food trucks I’ve tried within the last few months. 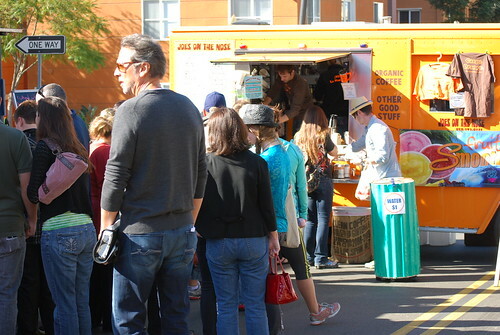 Among all the food trucks, Joes on the Nose is one of the oldest around. They been serving coffee, tea, shakes and the like since 2007. 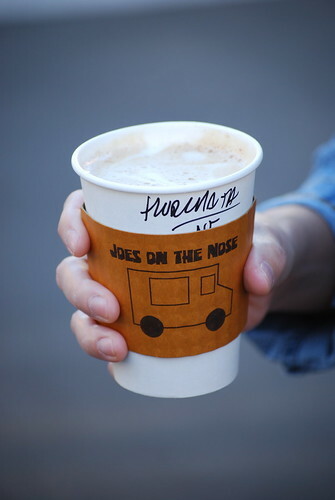 The bright orange truck is frequently seen around local farmers markets with long lines of people waiting to get their morning cup of joe. It’s no wonder because their coffee is excellent. A highlight on their menu is their horchata latte. They also sell ground coffee. I’ve had my eye on Devilicious to open up since last year; they premiered at the San Elijo Hills Christmas lighting to high acclaim. 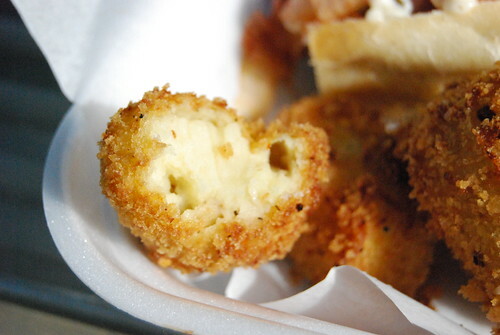 Now they roam the streets of San Diego, serving up often spicy and sometimes deep-fried delights which include their truffed tots (pictured below) and deep-fried mac and cheese. Unfortunately, their prices are steep for a gourmet truck in this economy. Sandwiches start at $7 for a modest-size serving— a bit pricey when most people are used to paying $5 at a sub sandwich shop for a sandwich and maybe a side or a drink. Their “fried yumminess” changes from day to day according to the whim of the chef — everything from deep-fried brocolli and cheese to deep-fried mac and cheese with hotdog bits. 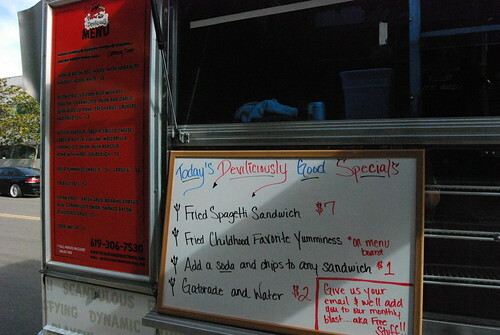 Be sure to try out their lobster grilled cheese ($9) if you have some extra cash. Kalbi Q specializes in Korean fusion tacos and burritos, and their fillings include short rib, spicy pork, chicken and bulgogi. While the short rib and pork fillings are not distinctive, their fries are worth a taste. Notable features include their $1 taco Tuesdays — a fantastic deal for students located near UCSD where seem to park every Tuesday. At the time of my visit, the lighting outside of their truck was dim but didn’t hide the fact they should wipe down the serving area of dried salsas and taco drippings. 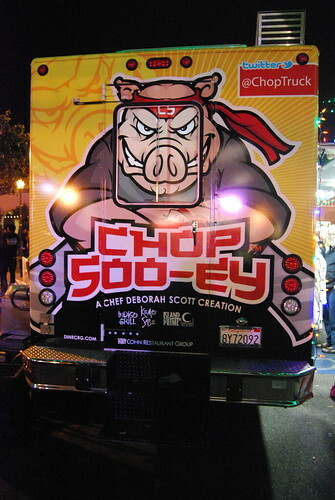 Chop Soo-Ey is part of the Cohn Restaurant Empire with Chef Deborah Scott behind the wheel. Their signature sandwich — the El Pignini — resembles a cubano sandiwch with its pork, swiss and mustard pressed between a bagette. 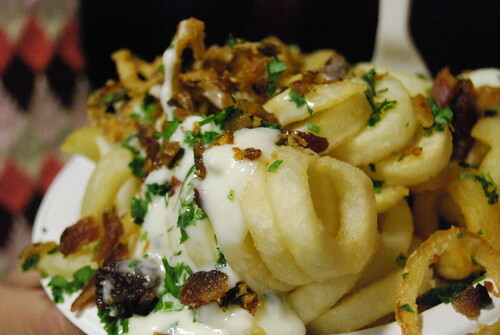 My favorite item is their curly tail fries topped with blue cheese and crisp bacon. Makes me almost forget that their mascot is a pig (which I’m eating). I had high hopes for this food truck but it seems that the Cohn Restaurant Group was just trying grab hold of a food trend, especially in light of Kemo Sabe shuttering its doors late last year. Wondering to yourself when and if you’ll ever have time to try out some of these food trucks yourself? On Friday, February 18, Fifty Seven Degrees will feature several food trucks and are billing it “the largest mobile food gathering ever.” At only six trucks scheduled to participate at the time of this posting, it will be interesting to see if they can live up to that hype. 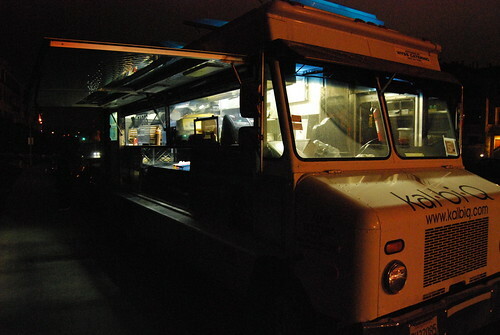 Food trucks so far include Papas Tapas, Tabe BBQ, Chop Soo-Ey, Sweet Treats, Corner Cupcakes and Kaminski Super Q. More information here. There’s a pretty good facebook page that lists daily location updates on most of the trucks in town. I see we’re getting our very own pop-up restaurant in town this month – maybe that will be the new trend that overtakes food trucks? That is a great Facebook page! It’s better than following individual Twitter accounts or if you don’t have a Twitter account. And I have heard that pop-up restaurants are the newest trend. But by definition, isn’t a food truck considered a pop-up restaurant in it’s own right? I’ve heard Ludo Levebvre of LudoBites describe his food truck as a pop-up restaurant. Hmm…good point, although I think there a small difference in that a pop-up restaurant by definition is only open for a small window, while a food truck is typically an open-ended endeavor (one hopes!). I do hope I have a chance to check out Relate this month before they end their run, although I may have to stick with tomorrow’s food truck event only and conserve my food adventure dollars. I’ve been to La Princesita (sp?) 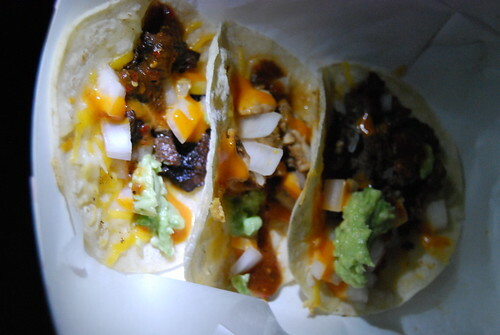 in Linda Vista (thought that was awhile ago and I never blogged about it – I hope it’s still around) for some cheap tacos and really, that’s it! I’ve been to one temporary food stand (Manny’s TJ Tacos) in Normal Heights (also has good TJ dogs). I saw a food stand place on University Ave. not too long ago one Saturday morning when Jake & I went to Super Cocina… might go and check that out soon. I count the food stands as mobile since they’re not always there when you want them! La Princesita is great, cheap food! Hahaha re: food stands. I need to visit one here in San Diego. Thanks for sharing Darlene! 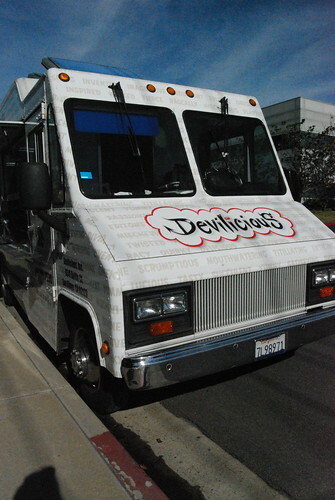 I saw the Devilicious truck last week and was wondering about it. Already had lunch then so just drove by. Were you disappointed with Chop Soo-ey? Hi Dennis! I think I’m more disappointed in the type of food served at Chop Soo-ey. Their El Pignini are premade (I saw a few sitting outside the few times I passed by the truck) and they put it on the grill to heat up prior to serving. For someone of Deborah Scott’s status, I would have expected more than french fries, tacos and sandwiches.